Italy, Germany, Netherlands and Switzerland can all secure qualification for next summer’s World Cup if they can beat Czech Republic, Faroe Islands, Andorra and Norway respectively on Tuesday night. The Netherlands are virtual certainties to secure their passage on Tuesday night with a win over an Andorran side who have conceded 22 goals from seven games with zero in reply and having mustered not a single point in this campaign. Italy will qualify if they beat the Czech Republic. Cesare Prandelli’s side would also be guaranteed qualification if they match Bulgaria’s result in Malta, though the Bulgarians are virtually assured of victory over a side that have mustered just three points from seven games and Lyuboslav Penev’s side won the corresponding fixture 6-0. The Dutch will qualify if they beat Faroe Islands and Romania do not beat Turkey in Group D. Holland have a superior goal difference of 15 over Romania so even if both sides win, Netherlands will be through in all calculations excluding the most pedantic of mathematician’s. In Group E, table toppers Switzerland need to beat Norway and hope that Iceland and Sweden draw so as to secure the progress of the only side to beat Spain at the last World Cup. 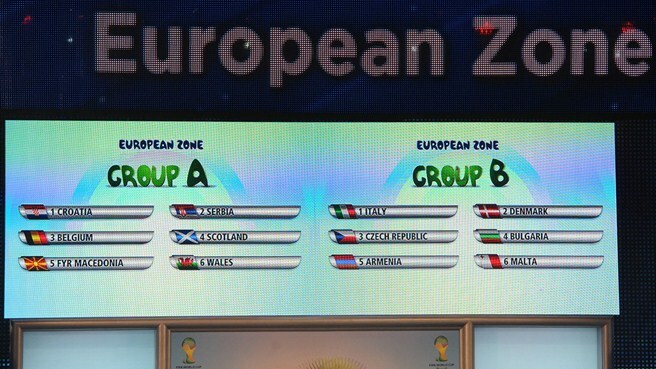 No European nation has yet secured their qualification and second place is still up for grabs in all bar one of the groups. All group winners are guaranteed qualification whilst the best eight (out of nine) runners-up go into November’s two-legged play-offs. Belgium and Croatia are runaway leaders of the this Group, though neither are in action on Tuesday. FYR Macedonia, Scotland, Wales and Serbia are playing for the minor placings and seedings in future qualification campaigns. With Italy looking to book their ticket to Brazil on Tuesday, it could also be a pivotal day in the race for second place. Bulgaria are a point above the Czech Republic in second with three games remaining and will stay in control if they beat Malta , the only team with nothing to play for. Armenia face Denmark with just one point separating second place Bulgaria from fifth placed Denmark (9 points) and second placed Bulgaria (10 points) with the Czechs third (9 points) and Armenia fourth also on 9 points. Germany can wrap up what is already a certain qualification with a win over the Faroe Islands if Sweden fail to beat Kazakhstan. The race for second place is still a three way battle between Sweden (14 points), Austria (11 points) and the Republic of Ireland (also on 11 points). Austria host the Republic of Ireland on Tuesday night with the loser of that game all but out of contention for the runners-up spot. Netherlands will hammer pointless Andorra to all but secure qualification, but the battle for second place is still a tight three way affair. Second-placed Romania host Turkey, who would go above them on goal difference with a win. Hungary could go second if they beat Estonia, all but eliminated already, and Romania do not win (depending on the scorelines). Norway can put themselves back in contention to win the Group with a win in Oslo over Switzerland, who would all but clinch their place in Brazil with a win. The sides currently lying second to fifth are separated by just one point with all having three games left to play. Iceland and Albania – both one point behind the second place Norwegians (who have 11 points) – face each other. Slovenia (on 9 points), are away to bottom side Cyprus. Table toppers Portugal are not in action (and have already played a game more than the chasing pack) while second placed Russia can overtake the Iberians with two games left if they beat Israel in Moscow. However, an Israel win would see them overtake Russia into second place. Luxembourg host Northern Ireland with both sides only playing for avoiding the ignominy of finishing bottom of the table. Leaders Bosnia-Herzegovina (16 points) host third placed Slovakia (12 points). Greece, who are only behind Bosnia on goal difference at the top of the table, are at home to Latvia, who are not in contention to qualify. Lithuania host Liechtenstein in a nothing game at the bottom of the group. It’s all to play for in England’s Group with just one point separating Roy Hodgson’s men (15 points) from Montenegro (also 15 points) and Ukraine (14). England visit Kiev knowing that defeat will see them staring down the barrel of a three way shoot out for second place as Poland host San Marino in a game which will see the Poles move to 13 points with all sides having two games to play. Spain are not playing on Tuesday which could see France go top if Didier Deschamps side can beat bottom placed Belarus in Minsk by at least four goals – though the world champions will have a game in hand. Meanwhile Georgia host Finland in a game which will only affect the lower rankings and seedings for upcoming qualification campaigns.